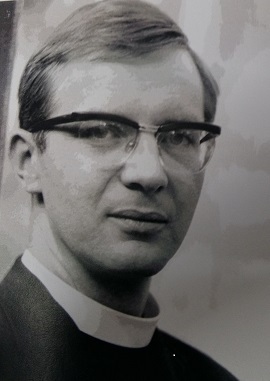 Fr Peter Clark at All Saint's Notting Hill. Whilst in the sixth form of my grammar school in Manchester, and much to the consternation of my parents, I began to feel within myself a vocation to the priesthood. This had been stimulated by my parish priest, Fr Brian Bason, Vicar of St Hilda's Audenshaw. He was a product of Leeds University and the College of the Resurrection, Mitfield. He introduced me to the Community of the Resurrection for which I shall always be grateful. The brethren of the Community have been for me an inspiration, example and support throughout my subsequent ministry. Having gained a place to read English at Christ's College Cambridge, I decided to pursue this subject rather than Theology in order to test the genuineness of my vocation. At Cambridge, my desire to be a priest would not go away. Indeed it was fostered and encouraged by my College Chaplain, Fr Michael Manktelow (later to become the Bishop of Basingstoke.) Having completed the first part of my Cambridge Tripos, I abandoned the study of English. I spent my final year at the university reading Theology. In order to do this, I had to spend the Long Vacation term learning New Testament Greek. My tutor for this was Robert Runcie, then Dean of Trinity Hall and later, of course, Archbishop of Canterbury. After Cambridge, my ordination training was at Chichester Theological College. There I was inspired and encouraged by another outstanding priest who made a lasting impression on my life. He was Fr Richard Eyre our College Chaplain who later became Dean of Exeter Cathedral. After Ordination in Wakefield Cathedral (as Deacon in 1963 and as priest in 1964) my title parish was St Peter's Huddersfield, the parish church of that West Riding of Yorkshire town. The priest who trained me there was Canon Anthony Hunter, another outstanding Mitfield-trained priest who was to become Bishop of Swaziland. After four extremely happy and fulfilling years in Huddersfield, I unexpectedly found myself in Notting Hill London. The hand of God must have been at work since this was the last place where I ever thought or wanted to be. Notting Hill was an environment totally unlike anything I had ever previously experienced in Manchester, Cambridge, Chichester or Huddersfield. In May 1966 a letter arrived from someone I had never heard of - Fr John Livingstone. It was an invitation to join a Team Ministry which he was establishing in Notting Hill, London. In May 1967, exactly one year after the first, a second letter arrived from Fr Livingstone with exactly the same message - "Come and join the new Team Ministry in Notting Hill." This time Canon Hunter urged me to take the call more seriously. After four very happy and fulfilled years at Huddersfield, it was time for me to move on. I visited Notting Hill again and this time said "yes" to the invitation. My parents were horrified when I announced that I was going to work in Notting Hill. Living in Manchester, all they knew of that notorious part of London was race riots and slums. However, I arrived in Notting Hill in September 1967. I was to live in All Saints' Vicarage, which was to become the Clergy House for the new Team. I was to be responsible for All Saints Church and parish. All Saints Church is a glorious building, extremely Anglo-Catholic in decor, full of statues and beautiful altars. Its huge bell tower which dominates all the surrounding buildings could come straight from Bruges in Belgium. During the last war, the church had been grievously bombed, but then magnificently restored during the regime of Fr John Twisaday. The religion at All Saints had always been exotic. In the 1930s the church was the focus of the Kensitite Protestant riots. When I went to be vetted by the Bishop of Kensington, he told me that he wanted me to make All Saints "normal Church of England". "Never!" exploded Fr Livingstone when I reported back to him. What was I do about the condition of All Saints Church? How was I to set about reviving and renewing this parish in decline? Faced with a few old ladies and lots of black children, I decided to begin by forming a Confirmation group. My experience with people from the West Indies was nil, but that was very soon to change! When the Confirmation group was underway - with no shortage of participants - I started to visit the homes from which the Children came. Wherever I went I was unfailingly met with the warmest of welcomes. Parents seemed delighted that someone, and specially someone representing the Church, was taking an interest and concern for their children. At one house, I rang the bell. An upstairs window was flung open and a lady exclaimed, "Who is that white man ringing my bell?" "It's Fr Clark from All Saints," her daughter replied. "Then bring him in at once," was the response. I reminded parents that if they wished their children to be presented to the Bishop for Confirmation, then they must play their part in supporting and encouraging them. To my pleasant surprise, I soon discovered that nearly all these adults had been practising Christians back home in the Caribbean - perhaps in the choir or Mothers Union or otherwise actively involved with church life. It did not take long for them to respond to my words of invitation and welcome. Little by little, the grown-ups started to attend Sunday Mass with their children. The word soon got round that All Saints Church was a place of welcome and acceptance. At first, the adults would attend Mass and then hurry away without becoming involved in other parish activities or events. A great break-through occurred during Christian Aid Week. One of the West Indian mothers offered to distribute collection envelopes around the parish. When it was noted that her offer was immediately and gratefully accepted, others seemed to gain confidence and from then on became more and more involved in parish life. One of these early pre-Confirmation visits caused me acute embarrassment and feelings of shame. In this home, the television was switched on. Mr Enoch Powell M.P. was holding forth denouncing black people and saying that they should be sent back to their countries of origin (ironic since when he was Minister of Health he had sent teams to Barbados to recruit black nurses to serve in British hospitals). I do not think the fine family I was visiting (mother herself a nurse and father working to keep London Transport going) were aware of my embarrassment. There was I, doing all I could to encourage these grown-ups to resume their practice of the Anglican faith, learnt back home in Barbados, whereas Mr Powell, a fellow Anglican and a weekly communicant, was saying exactly the opposite - "Go back home. We don't want you here." On returning to the Clergy House, I immediately wrote to Powell expressing my disgust and disappointment that he, a fellow Anglican was by his intemperate words undermining all I was seeking to do to build up my parish. Not surprisingly, my letter received neither reply nor acknowledgment. I had occasion to write to Mr Powell a second time shortly afterwards. In another speech, he accused West Indian people of terrorising his constituents in Wolverhampton - rowdy behaviour, dog excrement through the letter box etc. I responded by writing that if he actually lived in Notting Hill rather than in Belgravia, he would find that such things do not happen. I learnt subsequently that Powell had written to Fr Livingstone enclosing my letters and requesting him to rebuke me. Fr Livingstone responded by saying that he thought it improper of Powell to have sent him a private letter without the writer's (i.e. my) consent. Fr Livingstone added that he entirely agreed with the contents of my letters and that he did not propose to raise the matter with his assistant priest. He next received a furious reply from Powell expressing astonishment that a priest could fail to rebuke disgraceful behaviour and stating that he was sending the entire correspondence to the Bishop of London, Dr Robert Stopford. The extract is taken from The Rev'd Canon Peter Clark memoir Seven Years on the Front Line.